a. This can be a tricky process. However, it does not need to be done as often as your side edge. I try to avoid touching the base edge as much as possible, simply because it is so easy to screw up. Before you begin, you need to know the angle your base edge is set at. If you do not know, look on the manufacturers website, or ask a shop. A typical base bevel is from 0.5-1 degrees. A file guide will call a one degree bevel either 89 or 91 degrees. Same difference. 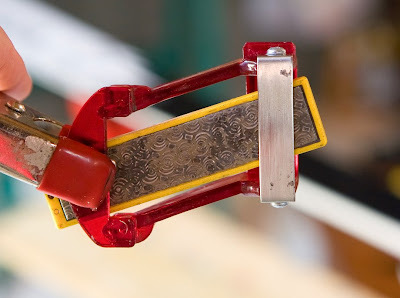 Begin by attaching a diamond stone to the guide using a clamp (as shown). Wet the diamond stone with your polishing solution or with a soapy water solution (keeping it in a spray bottle works well). This lubricates the stone and the edge yielding better results, and keeps the stone from becoming clogged with dirt. b. If part of the edge is damaged, rough to the touch, or case hardened from hitting a rock, begin with a coarse diamond stone (100 or 200 grit). 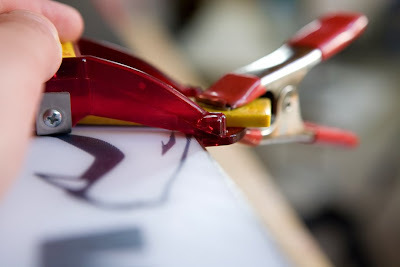 Sharpening the base with a file is difficult and can be very imprecise – generally, if your edge is heavily damaged, you may be better off having a shop take care of it. Also worth noting: a rough section of edge can destroy a file or diamond stone. To get by this, I keep an old ceramic stone/whetstone lying around that I will use to take down as much of the burr/damage as possible. Then I go to a coarse diamond stone, then a file, then finish with diamond stones.For normal maintenance and sharpening, use a medium (400 grit) diamond stone, and work your way toward fine (600-800 grit) stones. 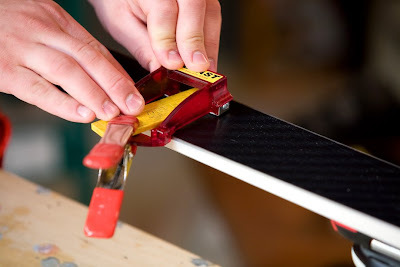 With the diamond stone face down on the edge, use both hands to maintain light and even pressure on the stone where it touches the edge and the guide where it touches the ski. Work from tip to tail. Again, mentally divide the edge into small sections as you work down the ski, always overlapping where you were before. Wipe down the edge with a wet paper towel every few passes – you will see all the black gunk that comes off, and you do not want this clogging your diamond stone. It’s also a good idea to rinse off the diamond stone between edges. Depending on the condition of the edge, a few passes may be all it takes.